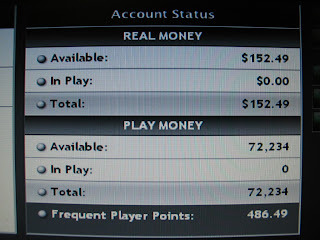 Today, August 18, 2009 I begin my challenge of playing at least 10,000 hands using my designated bankroll of $150.00. My purpose for taking this challenge is to see if I’m playing well enough to beat the luck factor in poker. I begin this blog today August 18, 2009 to document my 10,000 Hand Poker Challenge. This is how my challenge works. I have started with a bank roll of $150.00. The screen shot to the left shows my actual account balance as of today. I will be playing exclusively on at the 5 cent 10 cent no-limit tables. I will buy-in for $6.00 per table. This gives me a total of at least 25 buy-ins. My challenge is to see if I can play a minimum of 10,000 poker hands before I go broke. If I can then I am playing well enough to beat the "Luck Factor" in poker. 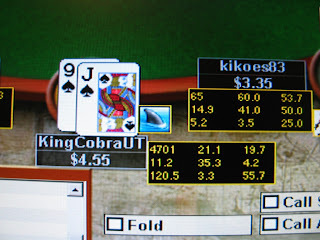 I feel my game has reached a point where I can profit at playing on-line poker. There are many good players and poker playing robots that I will be competing against. Let's see how I do. I will be updating my results regularly, so keep watching. The Photo to the left shows me seated at a 5 cent 10 cent no-limit table. I am KingCobraUT. Shown to the right of my name box are two things. First is a small icon depicting a shark’s fin above the water line. Second is a black box with some gold numbers inside it. Both are generated by an add-on application that tracks both my play and all other players. The icons symbolize each player’s style of play. The black box contains my stats. Starting in the top left corner this stat shows; total hands played so far (4701), top row 2nd from left; percentage of flops seen (21.1%), top row far right; voluntarily the money I put in pot (19.7%), middle far left; my raises pre-flop (11.2% this is above average), middle row 2nd from left; flops I've seen that win money (35.3% about average), middle row far right; cold call pre-flop (4.2%), bottom row far left; total money won or loss (won $120.5), bottom row 2nd from left; total aggression indicator (3.3 this is above average), bottom row far right; how often I go to showdown and win money (55.7% this is the true indicator of if you win or lose).